Today's random set is 7731 Mail Van, released in 2008. It's one of 45 City sets produced that year. It contains 66 pieces and 1 minifig, and its retail price was US$7.99/£4.89. It's owned by 5047 Brickset members. If you want to add it to your collection you might find it for sale at BrickLink or eBay. Ooh, I own this one. I thought it was cute as hell. I feel like it's been too long between drinks for the Lego City Postal Service. I like that the set number is the same as the number on the side of the van. Hey I have this set, too! I think it’s the first time I’ve had two random sets in a row. Well, I’m really not sure. I don’t pay attention that well. I know for sure that we had this, but I can't say for certain whether it was me, or my bro. Evidence of the crime of Lego not making enough Post Office stuff! I love this set! I agree that there needs to be more postal paraphernalia... at this point even another post van is overdue, but a post office is really really overdue! Teenager - a City set that gained value? There are probably 50 since then. But I would advise you against using Lego as your investment vehicle. I don't own this set but I like the 4 wide build and the color scheme. 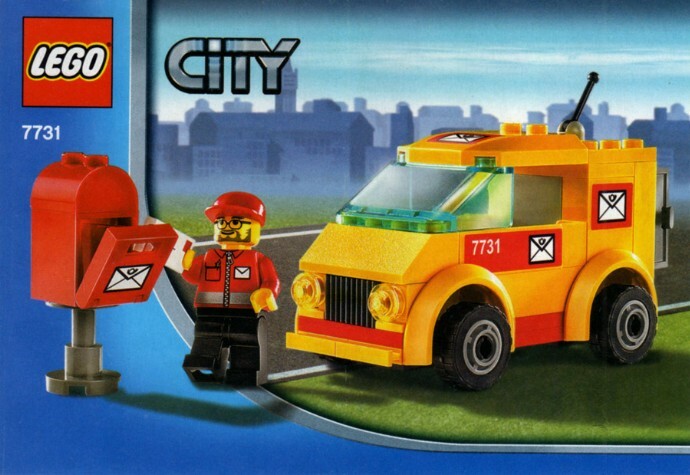 That LEGO xtra sticker pack has me looking forward to building a custom post office and a custom mail van for my town now. 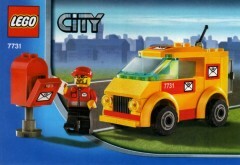 Of course, a new dedicated LEGO City postal set would be great, too! What a lovely thing that was, the yellow parts, the post box, the letters! I like a lot this set. It has a sort of 1980s feeling on it, especially for the fact it uses a car chassis that is very rare nowadays but was common back then. Huh, I own this set. Makes me nostalgic for the post and farm subthemes. They should really continue them. The last 2016 airport theme had a mail(wo)man (Same Torso as this set) + helicopter in it's Starter Set. 2018 Xtra packs had some letters and mailboxes as well, and soon a 2019 sticker pack. As far as sets I actually had with a mailman, was one long ago in a 1998 set (6420) with a yellow bicycle which was only in that one set ever. Wow. What a great set. You, one thing has been missing during the duration of "Great Vehicles" and that's a mail truck. Especially given how ubiquitous they are in real life. My Dad is a letter carrier, and I've bought a bunch of assorted LLVs including the Matchbox version around the time it came out. But this set came out long before I really paid much attention to what Lego was making. We need to bring back mail as a part of City. I think a delivery truck, tractor-trailer, post office, and a plane would make a pretty great subtheme. And maybe a polybag containing a letter carrier on a bike with a mailbox or something. Another set from the past. I have this one as well as the small mail plane in the same color scheme from around that time. Yes, Lego, should pay some more attention to other sub-themes inside the city. This would be one of them. You cannot beat the price for its play value as well. Love this set. I have it along with 7732. I picked this set up, like many others I assume, for the added variety of an actual LEGO mail vehicle. It did disappoint me that it had no doors. Doorless vehicles is one of my biggest LEGO related pet peeves. This must've been during my dark ages, but do want. For me, this set is a classic. One of the only sets I have more than one of. Nice little 4-stud wide van. Looks less than the sum of its parts though, to me. I wanted this set when it came out and, because it was inexpensive, I waited to purchase it in favour of getting larger sets first...unfortunately I waited too long and missed out! My mistake.